The motivation required to have a morning yoga practice can be difficult to find before 8:30am. My advice would be to keep it very simple – that way you can eliminate as many early decisions as possible! When your alarm goes off, push snooze and try to use those ten minutes to connect with your body and mind before you’re fully awake with distractions. And yes, this means staying in bed! Every morning we wake up with a new body. Yoga teaches us to connect with our body where it is in the moment. Letting go of our ego, we place no judgement or expectation on what we should do and instead listen to the subtle shifts occurring within. By staying in bed we make our world small, helping to keep our thoughts clear. Once we’re out of bed the muscle memory of our morning routine begins and our brain is bombarded with the the to-do list of the day. So, instead, push your sheets to the side and use those ten minutes of snooze to mindfully transition into a new day. Move through these basic poses paying close attention to your breath and how it moves through the body. Take deep inhales that expand the stomach, and long, complete exhales. Move at your own pace trusting that you know what is best for your body. After pushing snooze, roll over onto your stomach and do a few cobra poses. As the elbows squeezes in towards your side, reach your chest forward. Roll over for a big stretch. Toes pointed, shoulders lifted, every body part engaged. Bring your left knee onto your chest and clasp your hands around your shin. Allow the leg to rotate in the hip socket. Reach your left leg towards the ceiling, pointing and flexing your foot with your breath. Repeat on other side. Then, ease yourself into wheel pose by putting your feet on the bed and gently drawing your stomach towards the ceiling, arching your back. This expands both your chest and your shoulders. Push into your feet and upper arms for a deeper stretch. It’s time to start sitting up – draw the soles of your feet together and wrap your hands around them. Take a big inhale to arch your back and look towards the ceiling. Then, curl over and release your head towards your feet, but make sure not to strain yourself. This is supposed to be gentle! Now it’s time to start getting out of bed! Put both of your feet on the ground, facing away from the bed, and then lean back. This is called the sacrum slide. Turn around and face your bed again, but don’t hop back in! 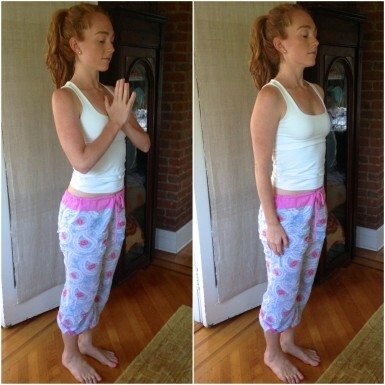 Drape your arms over your bed, opening your shoulders, and hold this pose for about 30 seconds, taking deep breaths. Now it’s time for downward facing dog! Walk your hands down to the ground, keeping your feet as flat on the ground as possible. Slowly roll up, turn off your alarm, and go into the morning with a greater sense of awareness and understanding of your mind and body.